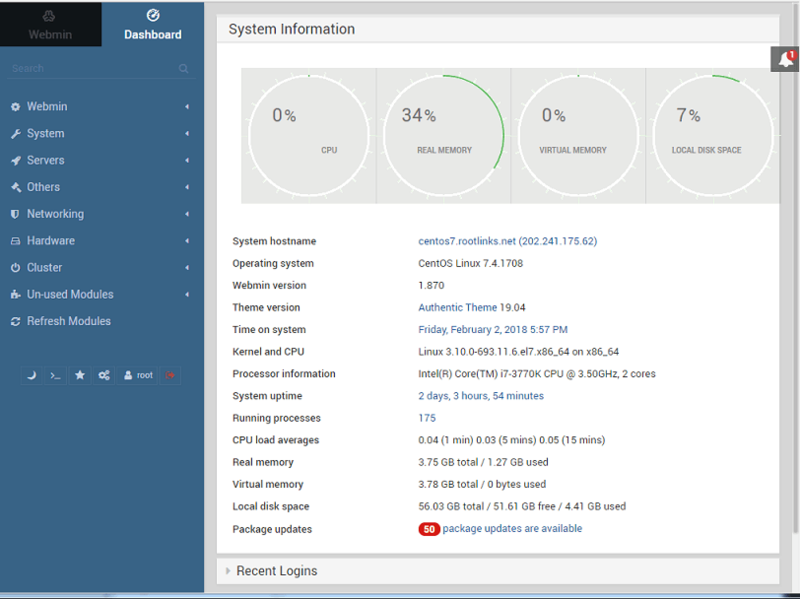 Install Webmin on CentOS 7 with yum ← RootLinks Co., Ltd.
# yum info webmin Available Packages Name : webmin Arch : noarch Version : 1.870 Release : 1 Size : 28 M Repo : webmin Summary : A web-based administration interface for Unix systems. License : Freeware Description : A web-based administration interface for Unix systems. 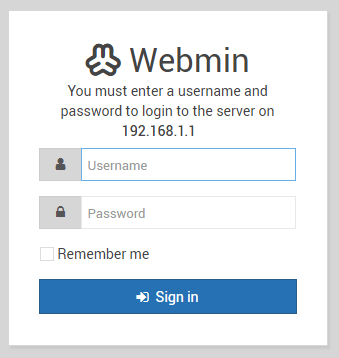 Using Webmin you can : configure DNS, Samba, NFS, local/remote filesystems and more using your : web browser. : : After installation, enter the URL http://localhost:10000/ into your : browser and login as root with your root password. # yum -y install webmin (snip) Installed: webmin.noarch 0:1.870-1 Dependency Installed: perl-Encode-Detect.x86_64 0:1.01-13.el7 perl-Net-SSLeay.x86_64 0:1.55-6.el7 Complete! Summary : A web-based administration interface for Unix systems. : browser and login as root with your root password. ･How can I change Webmin’s list of allowed IP addresses from the shell? The file you need to modify is /etc/webmin/miniserv.conf , in particular the allow= or deny= lines. 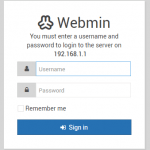 If the allow= line exists, it contains a list of all addresses and networks that are allowed to connect to Webmin. Similarly, the deny= line contains addresses that are not allowed to connect. After modifying this file, you need to run /etc/webmin/stop ; /etc/webmin/start for the changes to take effect. Naturally, the file can only be edited by the root user.